To safeguard your money, you must be able to extricate yourself from any bad investment quickly. Of course, the companies that sell mistakes don’t want you to be able to do that, so they use financial hooks to hold your money captive. Any financial product with a surrender value significantly different from the net asset value has financial hooks. For example, take the different classes of mutual funds from the giant American Funds: Growth Fund of America. Shares come in five different sales classes. Class A shares have an expense ratio of 0.65% in fees and expenses. Additionally, there may be a front-end load of 5.75%. If you invest in class B, there is no upfront sales charge. But if you sell shares before you have owned them for seven years, you must pay a sales charge that starts at 5%. And while you are holding class B shares, the expense ratio is 1.39%. Class B shares are the most gut wrenching. If investors have been holding them for nearly three years, they are still hit with a 4% redemption if they sell them early. It doesn’t matter if they should sell large-cap U.S. stocks and diversify into another asset class. It doesn’t matter that the company has already collected 4.17% in ongoing expense ratios. Investors are still faced with the decision of holding the fund another four years, at an ongoing expense of 5.56%, or selling the fund and paying a contingent deferred sales charge of 4.00%. The angst of these kinds of hooks in their investments deters many people from selling, even though they know diversification is critical to their portfolio. In this example, because the fund has been held just under three years, waiting a few months until the third anniversary lowers the redemption charge to 3%, probably the wisest decision. There is an obvious 3% hook if you sell, and a hidden 5.56% hook if you hold the investment. Class C shares have a contingent deferred sales charge of 1.00% in the first year and an even higher expense ratio of 1.44%. Needless to say, we don’t recommend A, B or C shares. These are all loaded shares, meaning they are laden with sales charges. Fee-only financial planners recommend two classes of shares at American Funds that are no load. The F1 class has no front- or back-end sales charges and an expense ratio of only 0.63%. The F2 class is used in retirement plans and eliminates the 12b-1 marketing fee. It has the lowest expense ratio, only 0.43%. A fair comparison can be made between C shares with an expense ratio of 1.44% and F1 shares with an expense ratio of 0.63%. The savings of F1 shares is 0.81%. Mutual fund salespeople claim this difference is less than the 1% of assets under management that many fee-only financial planners charge. But you are not getting any real value for a mutual fund sales charge. A different way of looking at it is that fee-only financial planners could earn 81% of their fee simply by reducing your expense ratios. Given an 81% discount, that would make their comprehensive financial planning available at a cost of the other 19% of their fee. Our example only looked at the five different share classes of Growth Fund of America. A fee-only financial planner has the entire world of investment options to choose from and may find better selections available at even lower expense ratios. B shares are just one example of the many investment choices with financial hooks. Whole life insurance also has a surrender value significantly lower than its fair market value. 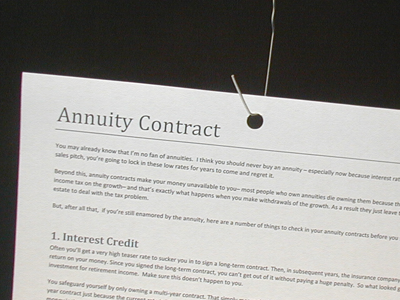 And annuities are sold with financial hooks that can lock your money up for several years. Private equity investments require even longer commitments of capital. Once you are invested, it is very difficult to get your money out until the fund liquidates many years later. During those years you may not even know if your investment was a good one. Because no public pricing exists for private equities, they continue to be priced to investors at their initial cost. That cost, minus fees, expenses and write-offs, typically produces a negative return over the first half of the investment. Private equity also may require you to commit to additional investments through the life of the investment. So not only is your initial investment held captive, but you must keep a sizable chunk of cash liquid to pay the private equity’s capital calls. Finally, the fees are charged on the basis of this committed capital, not just the amount you have already invested. It was these capital calls that recently hurt the investment strategy of the University of Virginia endowment. Having had significant investments in private equity, after the drop in their regular investments, much of the remainder will be needed to satisfy capital calls on their private equity. The result will be a much higher than desirable portion of the endowment in private equity investments. Private equity may be acceptable for an endowment with an infinite time horizon, but it is not for average investors who want access to their money during retirement. Hedge funds are poor investments for similar reasons. They typically require your investment to be committed for years, called a lockup period. During that time, managers not only take 1% to 2% of assets annually, but they also collect 20% of returns, both realized and unrealized. These extra fees are collected any time the fund exceeds its high-water mark. This compensation scheme is ripe for abuse. Many of the hedge funds that opened after the fall of 2002 hit their high-water marks in the summer of 2008. When the markets are behaving themselves, hedge fund managers enjoy the ride up, gaining 20% of the profits of markets trending upward. During this time, your money is held captive during the lock-up period, and redemptions are not allowed. If a typical fund charges 2% plus 20% of profits, and gains average 10% to 12% because the markets generally go up, the average fees being paid are in excess of 4%. You might imagine that would be enough money to keep hedge fund managers loyal to their captive customers, but it is not. But when the market winds blow south, fund managers defect. Many hedge funds are now closing. There is no sense running a fund that is 50% below its high-water mark. Without the incentive of proximity to the high-water mark and a good chance of making 20% of the profits, many hedge funds are not interested in merely serving the client. So hedge funds can hold your money captive when they are making high fees and abandon you and start a new fund after a significant market correction. This explains why hedge fund companies often have several different hedge funds, each with a different inception date. They can drop those that have poor returns and advertise those with good returns. As a result, the average life of a hedge fund is only three years. Every three years a market downturn provides the incentive for hedge fund managers to close the current fund and reboot to a lower high-water mark. Three years is also the average lockup period after which disappointed investors can finally get their money out. To add insult to injury, hedge funds are unregulated, which means the reporting of a hedge fund’s return is completely voluntary. There is a hedge fund index that aggregates these voluntarily reported returns, but the number isn’t reliable. Hedge funds with poor returns don’t report, and hedge funds that fold and go out of business stop being included. Unrealistically high reporting of returns to attract customers, a three-year lockup period and exorbitantly high fees sounds like a way to make money for the fund but certainly not for the average investor. My final example of financial hooks involves captive trustee accounts. Sometimes estate trusts are established in legal documents that name a bank or other financial institution as the trustee with no method to change that trustee. The banks call these “captive” accounts for a good reason. Beneficiaries cannot take their business elsewhere and may have to suffer poor service or high fees. Banks may charge fees as high as 4.5% while better service options are available for a fraction of a percent. A bank here in Charlottesville pushed one of our clients to get their estate documents drawn up by an attorney who charged the client thousands of dollars and then wrote the bank in as the trustee in the estate’s legal documents. I’ve learned through experience that the more financial hooks keep you captive to a particular financial services company, the poorer the service. And without a way to extricate your investment, you are stuck receiving inferior returns for years. It’s a simple but powerful lesson: Avoid anything that puts financial hooks on your investments.